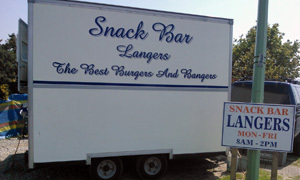 Whose motto proclaims "The Best Burgers And Bangers"
Even some salads - for the ladies, perhaps? If it was a car -- Aston Martin Lagonda. If they were passing by -- Alan Winstanley and Clive Langer.